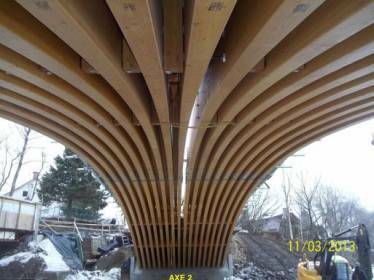 In January of 2013, Portland Bolt supplied shear plates, split rings, long galvanized threaded rods, hex bolts, lag screws, and lock nuts for the Bishop Road Bridge project in Portneuf, Quebec. Portnuef is a small town that is about 36 miles outside of Quebec City. Portland Bolt manufactured these items on a standard lead time of two weeks and packaged them for travel across the continent to Quebec. 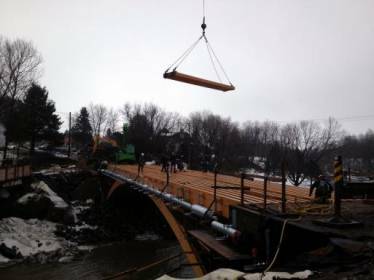 The 22 foot wide, 125 foot long new bridge traverses the Portneuf River, which is a tributary of the Lawrence River and carries the traffic of the roughly 3,000 residents of Portneuf on Bishop road. 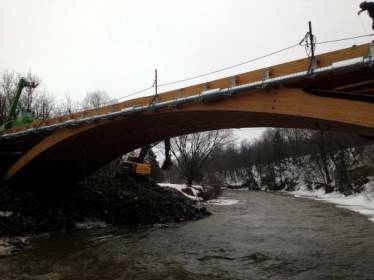 The 5,000 pounds of rods and hardware supplied to the project were critical in the assembly and construction of the bridge. 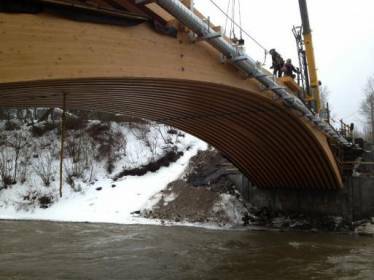 The 7/8″ x 120″ and 7/8″ x 138″ galvanized rods were manufactured with a semi-cone point to ease installation through the multiple laminated wood beams that make up the structure of the bridge. The bridge was designed and constructed in a unique way, using fewer fasteners than perhaps a normal wooden structure by using the long galvanized rods to run through every laminated beam essentially pinning them all together with the help of shear plates, washers and nuts. Portland Bolt’s unique capabilities to efficiently produce long custom rods and our ability to hot-dip galvanize with our own in-house galvanizing plant allows Portland Bolt to be a competitive and entrusted supplier to jobs and customers all throughout Canada and the United States. In this case, the jobsite and customer were both almost 3,000 miles via road from our 94,000 square-foot facility in Portland, Oregon. No matter your location, please give Portland Bolt an opportunity to show you why our customers entrust Portland Bolt with their critical bolt requirements time and time again.